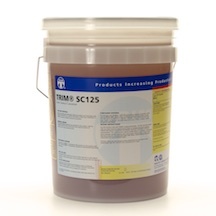 TRIM® SC125 is a low-oil, semisynthetic coolant concentrate. It is effective in general-duty machining and grinding of most materials. It is an exceptionally clean fluid and provides superior cooling, lubricity, and corrosion inhibition for grinding cast iron and mild steels. This product does particularly well in machining cast iron and in centerless or cylindrical grinding applications.